For eligible patients, the right orthodontic treatment provides many benefits including a more pleasing smile and healthier mouth and teeth that have a better chance of lasting throughout your life. Dr. Douglas Knight provides an array of orthodontic solutions, including jaw surgery, braces, and retention to give you a beautiful smile that you’ll enjoy for a long, long time. Another treatment option provided by only a few orthodontists is a temporary anchoring device, originally developed more than 30 years ago. Dr. Knight is one of the few orthodontists who offer this little-known solution. Although TADs are not for everyone, they provide an alternative option to using another tooth or group of teeth as a “post” against the corrective force applied by braces and retainers to move teeth into alignment. 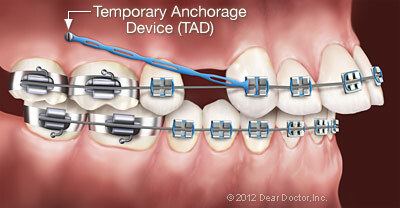 This removes the possibility of moving the anchor teeth and also offers the opportunity of reducing treatment time. You will need to take some additional steps to care for your temporary anchoring devices properly, but adding this takes minimal time. To maintain your TADs, you’ll need to use an antimicrobial solution to brush and clean them twice daily. Just dip your toothbrush into the solution after cleaning your teeth as usual and brush the TADs as a final step in your routine. Contact Your Tacoma Orthodontist Today! Whether you’re in need of TADs, metal braces or clear aligners, don’t wait to seek orthodontic treatment. In some cases, early treatment may also mean shorter treatment. For more information, contact our office at 253-627-5550 or request an appointment online now!